Restore a fresh look to your face after receiving a relaxing, customized facial by our clinically trained Aestheticians at Nouveau Cosmetic Center. Facials are beauty treatments to enjoy as you relax and indulge in pampering. At Nouveau Cosmetic Center we customize your facial after completing a full skin analysis. Your Aesthetician will look at your skin under a bright magnification light and will identify any skin care concerns including clogged pores, blackheads, dryness, dullness, etc. A good facial includes surface cleansing, deep pore cleansing and potential extractions, exfoliation, stimulation, toning, massage and moisturizing. Our Aestheticians tailor your facial based on your skin type; oily skin will get additional cleansing and dry skin will get additional moisture. The first step to a facial at Nouveau Cosmetic Center starts with cleansing, removing makeup and facial grime. This feels like a relaxing facial massage. Next, a series of steps in your facial occur including exfoliation, steaming and extraction, possible microdermabrasion, peels and masks. Your skin will feel smooth and nourished. Your Aesthetician will guide you on your quest for radiant, healthy skin. Our philosophy of great looking skin includes areas of focus such as correction, stimulation, and protection. At Nouveau Cosmetic Center we pride ourselves in helping you achieve your goals of glowing skin by educating you on home care maintenance. 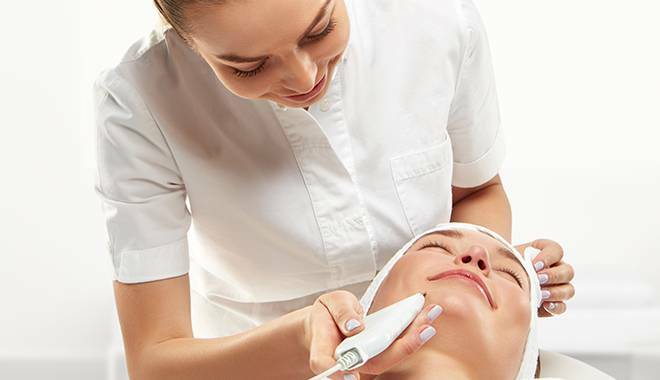 Facials can often be augmented with other services including dermaplaning (removal of the outer most layer of dead skin with a blade), microdermabrasion or a chemical peel.